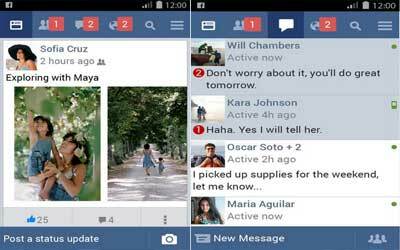 Previous version Facebook Lite 68.0.0.10.268 apk for Android will help you to downgrade or install older app easily. This is one of the best Social apps. The Lite edition of this messenger app is designed to cater to mobile devices that have low-quality processing power, and as the name implies, the size is also pretty ‘lite’ with only approximately 262 kilobytes. That’s pretty small-sized in comparison to the full application. Furthermore, this application is also suitable for devices that have weak internet connection, as the full version of the application is heavy and might load very long with slow internet connection. As it is meant to serve such purpose, the design and functionality aspects of this app is pretty much rudimentary. However, all of the basic and key elements remain, which includes Pages, Messenger, Groups, and many more essential, key features. In order to experience the very core of Facebooking, users can also depend on notification support to enhance their social networking experience on FB even better. If your device has rather a poor processing power and limited internet connectivity, then this application is for you! It is very efficient with its usage and processing of data, it is also quick to be installed thanks to its small size, it has a fast loading period, and all in all perfect for those who wish to stay connected in Facebook Lite using their mobile devices without having to worry about slow connection and crashes. Improvements for reliability and speed. This app is better because it’s faster, lighter on system resources whilst having the messenger the main Facebook app lacks. It is very simple and easy to use. Share free Android apps and games in APK file format. APKTrunk helps you to get the latest version and also older version with direct download. We never share paid or modified apps and games as APK. If we violate the copyright you can contact us. © Copyright 2015 APKTrunk - Android APK Collection All Rights Reserved.